South Hill Guitars formed in 2014 and has already performed at a wide variety of venues in the Northwest including the Northwest Guitar Society in Bellingham, the Northwest Guitar Festival’s 2016 convention in Moscow, the Fridays at Four Series at Whitman College, and for Gonzaga University and the Tri-Cities Guitar Society. 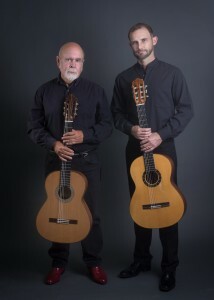 Guitarists James Reid and John Paul Shields share a love for South American music as well as contemporary compositions and this is reflected in the repertoire of South Hill Guitars. The duo has recently programmed works by Maximo Pujol, Jaime Zenamon, Alfonso Montes, and Celso Machado and the duo has also had works written for it by William Whitley and Jacob Johnson. South Hill Guitars received a grant in 2016 to record their debut CD, Lonesome Coyote. In addition to his activity as a member of South Hill Guitars, James Reid has had a long and extensive solo career and he has released eight solo CDs the most recent of which was Guitarra Americana. Reid is the founder of the Northwest Guitar Festival, and he directs the guitar program at the University of Idaho. Most recently, John Paul’s career moved him to Peru, where he studied the rich intricacies of Andean folk guitar music. He worked with several renowned musicians in Peru, including Frank Collazos, Luis Salazar Mejia and the legendary Ayacuchan guitarist Raul Garcia Zarate. Mr. Shields teaches guitar at the Holy Names Center and Spokane Falls Community College in Spokane, WA.